A painter, former world wrestling champion, property tycoon and an politician- President Khaltmaagiin Battulga won Mongolia’s presidential run- off election in 2017, with the anniversary of his first year in office approaching, the president talks about Mongolia- South Korea relations, stabilizing an economic crisis and his plans for his country. – As the President and highest leader of Mongolia, what is your vision for your nation? Mongolian people overcame many challenges throughout the years and established our democratic and sovereign state of Mongolia, which honors human rights and freedom. Today the Government of Mongolia and its people, are protecting and guarding independence and sovereignty inherited from our ancestors to hand-out to the future generations, as well as honoring peace, developing friendly relations with all the countries of the world, and aiming to develop relations in political, economic and other fields. – I have heard that Mongolia has been experiencing some financial difficulties as of late. Our Asia Journalists Association members believe that you will lead the country into stability. What are some measures/policies you have to overcome such difficulties? Economic activity in Mongolia has traditionally been based on herding and agriculture. But in recent years Mongolia’s extensive mineral deposits, however, have attracted substantial amount of foreign investment. Despite GDP growth accelerated to 17.3 percent in 2011 due to mining boom, economic growth decreased to 1.2 percent and 5.1 in 2016and 2017 respectively. The total external debt has increased in Mongolia over the past two decades despite there had been a promise that the mining projects would increase national well-being. We all realize that dependency on mining sector made Mongolia’s economy much vulnerable when certain commodity price falls in world market. 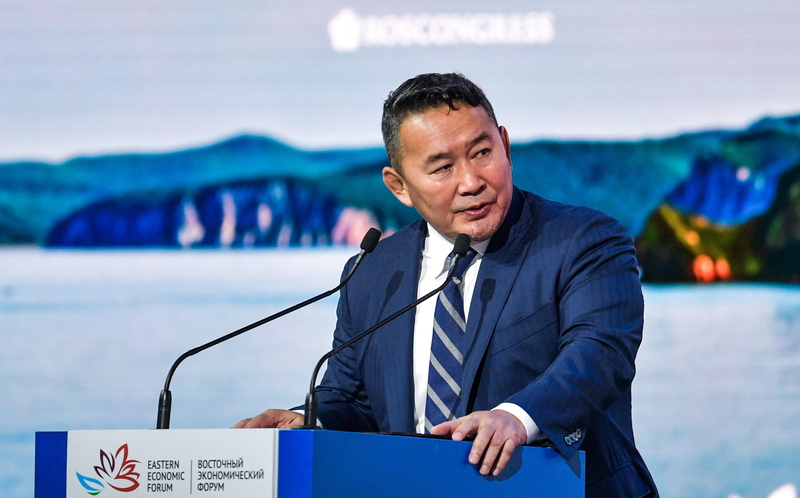 To avoid this negative impacts on the economy, Mongolia needs to diversify its economy and make the economy less dependent from only one sector or single market. There is a need to direct the revenue earned from mining to the ordinary people. In a broader sense we need to invest more in our society, education, technology and infrastructure. I believe that it will certainly provide more security to ordinary people and lead to more efficient and dynamic economy if we could wisely manage the wealth created from mining industry. I am cooperating with the government on many issues to solve including economic diversification and developments of SMEs which are highly critical for Mongolia’s development. Supporting infant industries are also crucial to develop export oriented products. Mongolia has a natural potential and competitive advantage in developing agricultural organic product, renewable energy, tourism as well as traditional main industry of mining. The current government of Mongolia has been working to promote non-mining sectors, which is important in diversifying the export oriented products. We welcome foreign investors in all those sectors and the principle should be based on the mutually beneficial. – Mongolia and South Korea have had diplomatic relations for a long time. Do you have any plans on visiting South Korea in the future? What kind of a relationship do our countries need to maintain in order for future development? Please tell us any message you would like to convey to South Korea’s President, Moon Jae-in. Mongolia attaches significant importance to the development of bilateral relations with the Rpublic of Korea. Mongolia and the ROK relations are developing within the framework of the Comprehensive Partnership in all fields. The ROK is one our main partners in trade and investment. Over 40 thousand Mongolian nationals reside in the ROK on long and short-term stay. Currently many Korean restaurants are operating in Ulaanbaatar and Mongolians are very much interested in Korean goods, television series and Korean language. These are the indications of the friendly relations between our people. Being rich in mineral resources is one of the advantages of Mongolia. While the population of Mongolia is relatively small, the intellectual heritage and level of education of Mongolian people are high. We need advanced technology for our treasure to transfer into the value added products. The world has witnessed the ‘Miracle of the Han river’. The ROK is leading in many fields such as industry, science, information technology, trade, service sector. There are many aspects for the Mongolians to learn from this development. If we merge our advantages there are wide possibilities for us to develop more constructive, effcient and more wide-ranging cooperation. For instance there are possibilities for both countries to cooperate in animal husbandry, tourism, mining, SME, agriculture, food processing sectors. Mongolia resides in the closest proximity to two major markets. Korean investors have favorable conditions for the production and export of value added products,based on Mongolian raw materials such as wool, cashmere, leather etc. The exchange between people of our countries plays an important role in the development of bilateral relations between our countries. In order to strengthen and develop the friendly relations between people and increase the people-to-people exchange it is important to implement visa free regime for the nationals of both countries. We should take orderly and concrete steps in this regard. I met with the President of the ROK, H.E. Mr.Moon Jae-in last year during the Vladivostok Economic Forum and held warm talks. Our meeting was a very fruitful one. We exchanged views on the wide range of issues such as economic cooperation and exchange of people directed to the expanding of scope and development of bilateral relations. The President of the ROK, H.E. Mr. Moon Jae-in kindly rendered an invitation for me to visit the ROK. I intend to visit Your beautiful country when the conditions are favorable for both sides. The people of our two countries maintained ties since ancient times. Nowadays, uur relations are being further enriched with new content. I wish all the best to the friendly people of the ROK. – North Korean leader Kim Jong Un and South Korean President Moon Jae In, at the first such summit in 11 years, agreed to pursue a permanent peace and the complete denuclearization of the divided peninsula. As Mongolia holds diplomatic ties with both countries, what is Mongolia’s position? Mongolia always reaffirms its firm position for the maintenance of peace and security in North-East Asia and for the denuclearization of the Korean Peninsula. Mongolia applauds and welcomes the positive outcome of the historic summit between the leaders of North and South Korea. We hope that the South-North Summit meeting will be an important impetus for ensuring the peace and security on the Korean peninsula and confidence-building in the region. – What does Mongolia’s ideal future look like? Which direction should the country be headed? Our country has a huge potential for future development. Mongolia has a territoryof 1.5 million km2 and abundant underground recourses of gold, silver, coal, copper, iron as well as above-ground treasures. Also we have over 50 million live stock and rich resources in agriculture and live stock industry. As you know, we have been maintaining Mongolians nomadic lifestyle and culture for many hundreds of years. Mongolia might be the last country that has preserved the genuine nomadic culture. Mongolia ratified the Programme on Sustainable development in 1998, the National Prorgamme on the Sustainable development in 2011, the Guidelines for the Sustainable Development in 2016 respectively. The main goal of these Programmes is to attract foreign direct investment, improve law environment, expand the trade with neighbouring countries, increase the capacity of border ports, intensify the production of food processing, agricultural production, advance the projects in mining and other sectors. We have also put forward an objective to establish the national educational system, eliminate all forms of poverty in order to approximate the service standarts in education, health, social welfare to the international standarts and norms.Also we put forward a goal to efficient use the natural resources and preserve balanced ecosystem. Within the framework of these objectives it is necessary for us take such measures as to advance the major projects, that are under discussion with other countries, facilitate trade, improve the infrastructure, inspection and structure of border ports, intensify agricultural production field etc. I am confident that the programmes will be successful implemented. – If the North Korea-America talks were to be held in Mongolia, in what sense would it be meaningful? As a nation situated in Northeast Asia, Mongolia has been resolutely committed to the peace and stability of the Korean Peninsula. Carrying on our friendly and historic relations with both the U.S. and DPRK, we are ready to offer our full support for the landmark North Korea–United States summit.